Lahore: PTI former Punjab president Ahsan Rasheed has said that dream of change would be fulfilled this year and masses are with PTI. They said that those who looted the national exchequer would be disappointed and Tehrik-e-Insaaf would clean sweep in the coming general elections. Vision given by Imran Khan is now talk of the every town and people across the country would play their role in making Pakistan real prosperous which would be possible through able and sincere leadership. Ahsan Rasheed and Abdul Aleem Khan said that Imran Khan and his team have no stigma of corruption and this leadership is the need of the hour. They were addressing the of which were headed by Asghar Kaliyar and Ejaz Minhas, Sajjad Haider, Naveed Wariach, Lubna Malik, Rao Raas and Fayyaz Oathee represented different areas of Sargodha.They said that like all other parts of country, silent revolution also took place in Sargodha and people are fully aware to end the traditional politics in the coming elections. On this occasion,they briefed Ahsan Rasheed and Abdul Aleem Khan about intra party election’s strategy of PTI in Sargodha District. 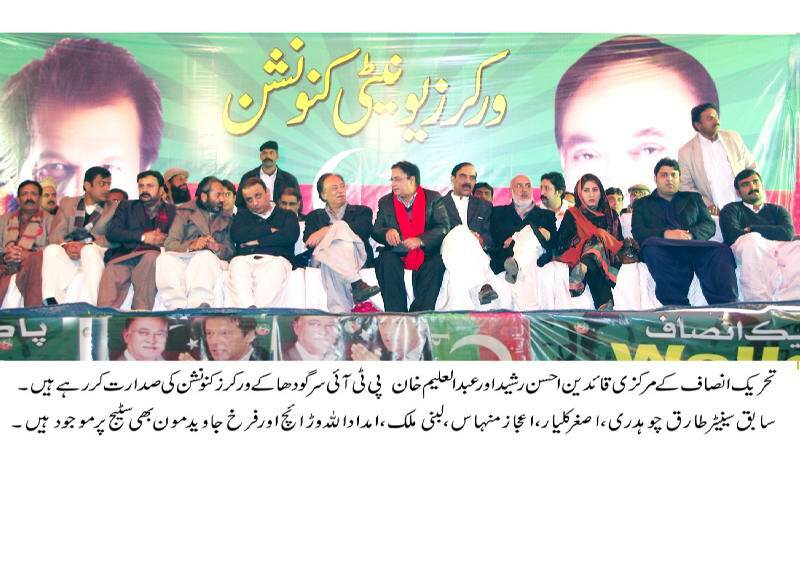 PTI Leaders Mian Haamed Meraj, Sardar Kamal Umer, Sheikh Mujeeb, Furrukh Javed Moon and Sheikh Aamer were present representing PTI in this Workers Convention.